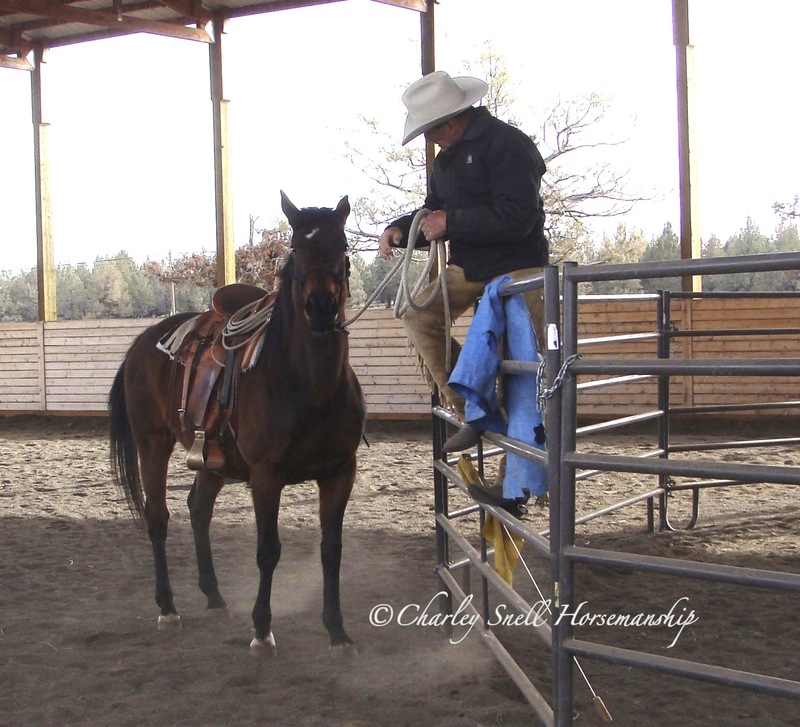 In the third part of this series on working from a fence with Belle, his mind-of-her-own mare, Charley Snell explains to Eileen Chambers a bit about how horses communicate. Hindquarters. Hindquarters. Hindquarters. I have heard a lot from you about “getting the hindquarters” but, to be honest, I am not sure what the heck you are talking about – and I’m probably not totally alone on that score. Would you explain this whole “getting the hindquarters” deal? Okay. Let’s start with “the nature of the beast,’ so to speak. Horses, by their very nature as a prey animal, have been gifted from above with a flight mechanism. That means it is a horse’s basic instinct to run when they are afraid, startled or unsure. Belle mentally preparing to yield the hindquarter and line up. Sounds like me on bad days! Exactly. I mean---well --- you said it. But what’s that got to do with the hindquarters? The hindquarters are where all the business of that flight mechanism takes place. When a horse yields its hindquarters to you, it means something has changed in its thought process. At least for the next two seconds. Nice. She is on the page and thinking about what we may be up to next. With Belle, that’s not all that far off. Again, to the degree that I can or cannot get a horse to yield the hindquarters to me is the degree that the horse will or will not come into compliance with what I want it to do. And I mean with whatever --- whether it be dressage, working cows, riding down the trail or opening the gate. If my horse is lined up, head to tail looking at me, is that what you mean? Not much coming through on her part. Nope. If you don’t have the hindquarters, you are not getting to the horse’s mind. It is not good enough to have your horse simply turn and face you. Sure. That’s part of it. The horse needs to yield its hindquarters. Otherwise, the horse will still think that he is the jockey and you are the two-legged nuisance on the other end of the rope. What do you mean by the word, “yield?” What does that look like? What am I literally looking for here? Is it alignment? Is it in their expression? How will I know when those hindquarters are yielded? 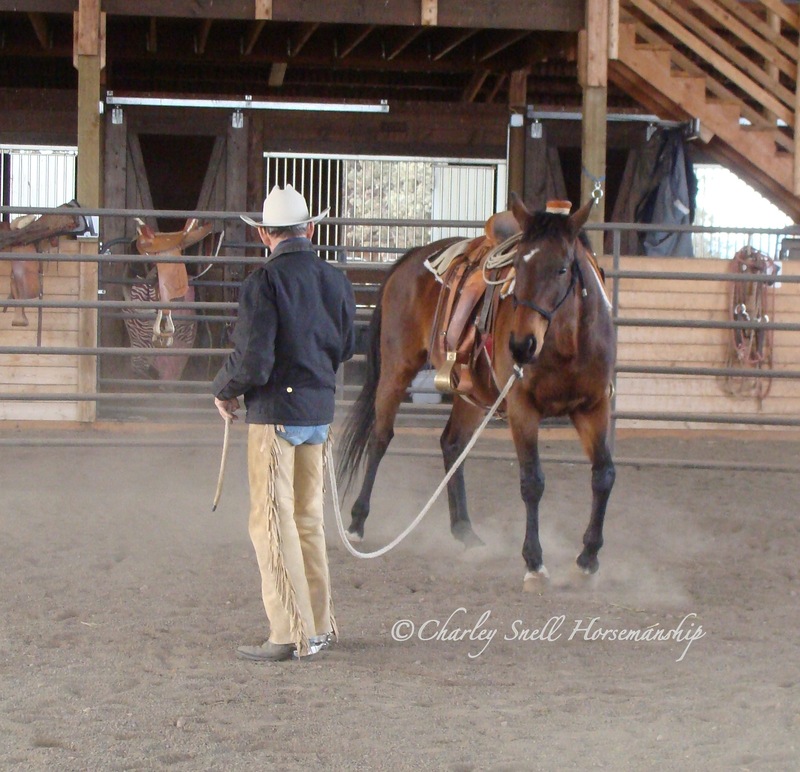 Well, you will know if the hindquarters are yielding if you ain't getting' kicked in the belly as he goes by or hitting the end of the halter rope hard enough to cause you to do some unusual gymnastics! Gee. That’s really, really helpful, Charley. 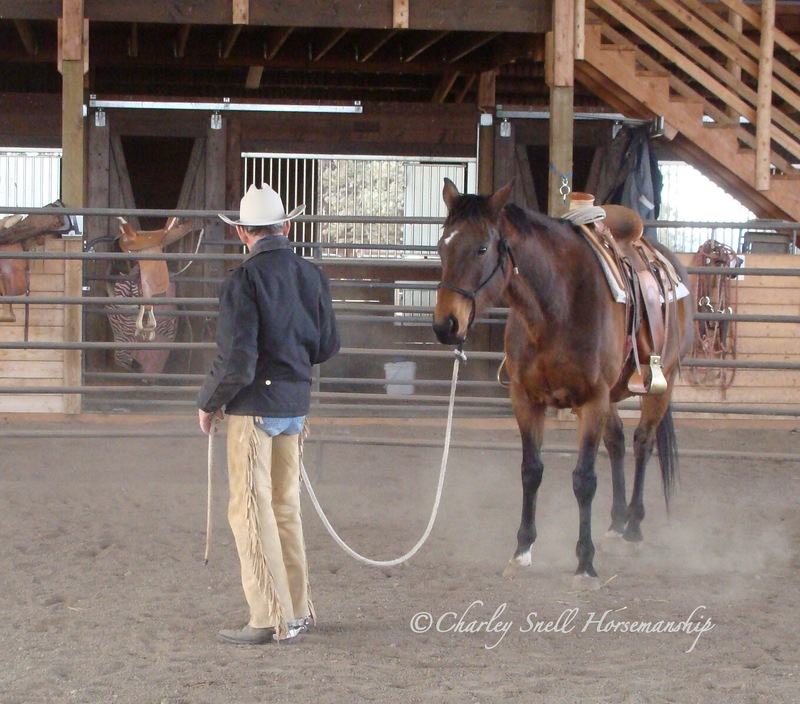 Seriously, when a horse yields the hindquarters, there is the roundness of a united circle on the halter rope with the stepping under of the inside hind leg accompanied by a changing of the eye or thought, if you will. They can either learn to wait for you here or go on and change directions. Both are necessary for the development of the horse. In essence, you are talking about learning how to speak “horse.” About understanding what your horse is communicating to you through body language. I do not know about speaking “horse,” cause I don't nicker or snort. Horses are aware of our body language and the language of our inner man, so to speak. You can kind-of tell, if the horse is ready and willing, like little Belle here. When she yields those hindquarters, what is happening is that she is mentally releasing to the whole deal of being with me. She is not holding anything back. As I fixed it up and waited she came through nicely. So, if your horse is exhibiting certain behaviors, even bucking you off, are you saying that you should check the hindquarters? Well, if he is bucking you off, you might want to check for a good place to land first and, then consider the hindquarters before it happens the next time! 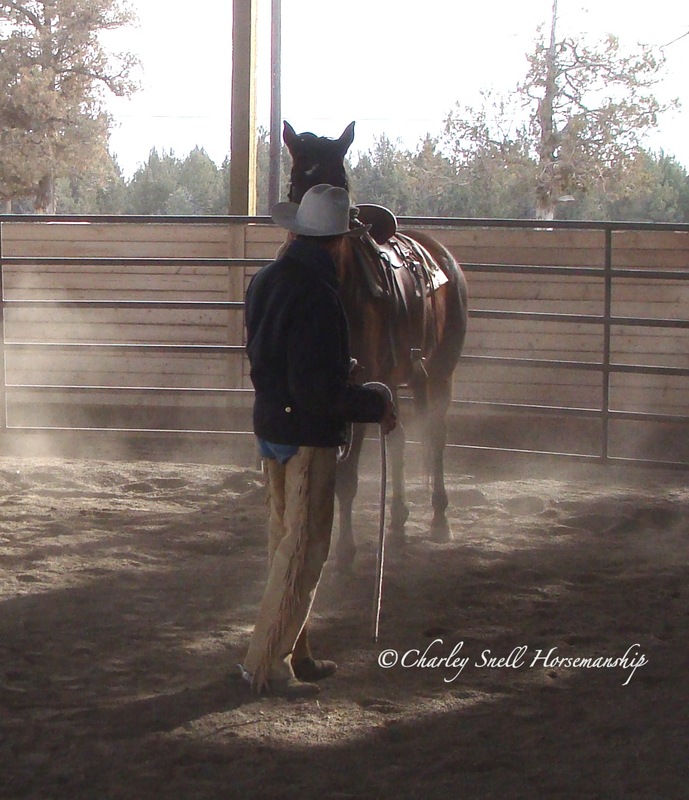 I like telling the story of a lady who brought a horse to Ray Hunt at a clinic in Broadus, MT. At the start of the clinic, she was all concerned. “I don’t want you to hurt him,” she said to Ray. Well, that first day, her horse just bucked her right off. It didn’t take but a few minutes and Ray had those hindquarters. He had that thing lined up and listening to him -- and I don’t mean kind-of, sort of. I mean, “Now.” No wishy-washy there. Now, you don’t go about that in a brusque, cruel or abusive manner but, like a teacher interacting firmly with a student who doesn’t want any part of school, you have to make your requests very clear -- and you make sure that the response you get in return is also as clear. 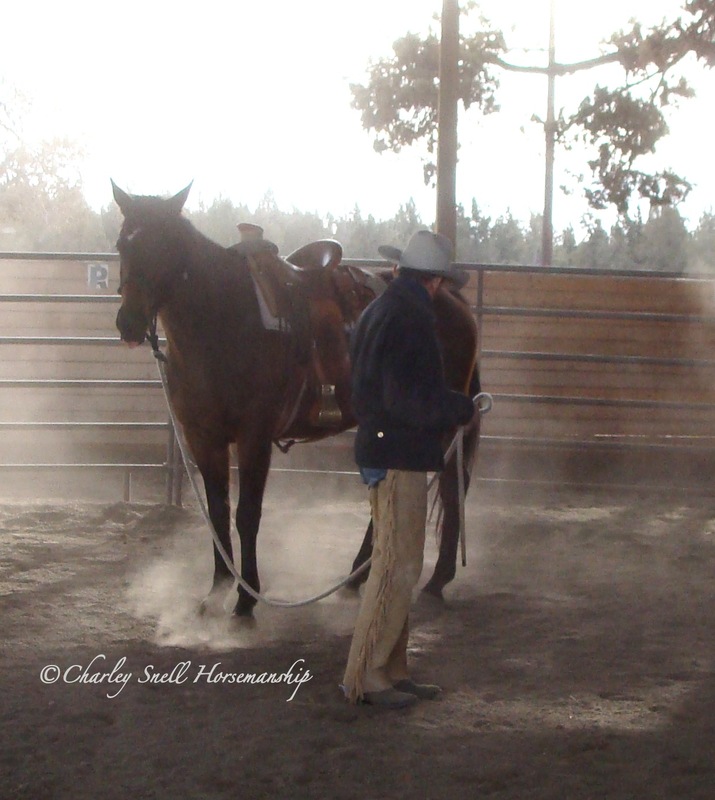 Getting the hindquarters is pretty much Step #1 when it comes to working with a horse. Basic homework on the part of the human. Basic communication. Sure. Some days you won’t get the hindquarters to yield perfectly. Be patient. Be consistent. Keep fixing it up. Offer a good deal for the horse until you get the hindquarters. This is just the way it needs and has to be for you and the horse. It may take working with a horse a time or two for this to have some consistency but I will get it. Even with Star, who I have been working with for about seven years, I routinely check. Do I really have those hindquarters? Until I do, we don’t go forward. When I get up here on the fence, I would like those hindquarters to yield also. Watch. The hindquarters start to roll, there and there. At least her mind was with me. I am not asking for the front because moving her front quarters does not mean the same thing as moving the hindquarters. With a horse like Belle, like most horses out there, if you are not getting her to yield the hindquarters, you are not getting to her mind. What is it about working from the fence that you like? Working on the fence fixes it up for the horse to mentally make the decision to come alongside and let you get on. There is a vast difference between a horse standing by a stump where you can get on and mentally making the decision to be alongside so that you can get on. There is a vast, vast difference. Again, everything we are doing is to fix it up for the horse make the decision to be with us. Now, especially for a really green horse, working from the fence allows the horse to get used to a human being above them. For me, I am at a safe vantage point to do a variety of things. A long while ago, I saw photos of Bill Dorrance at his ranch using a raised platform that was about three feet high and about fifteen feet long to accomplish the same thing. With a platform, he had a lot of room to work with the horse and be above them. Again, I do this a bunch with a horse that is green. Sometimes I do this with Star just to check and see where he is at. Again, I don’t ever just take my horses for granted or assume where they are at. But with Star, when I ask him to yield those hindquarters, he will do it and leave his front-end parked because he has found this feel. Here on the fence, a really green horse can get really used to that -- along with the feel of ropes, tarps, flags, the whole nine yards. Also, working at the fence has the practical application for when you are out in the hills and want to get on a taller horse. Same deal or if you are older or not as active. The horse learns that the hindquarters and the reins are connected. 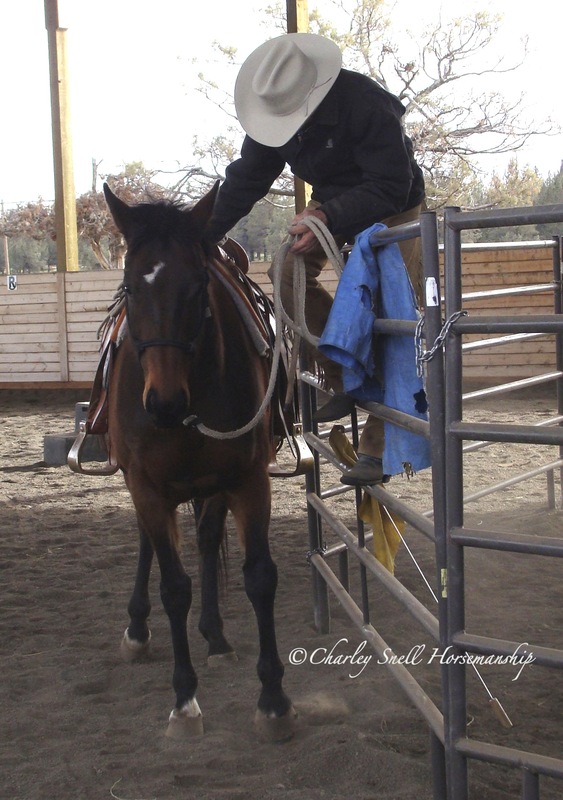 Here on the fence, we are connecting the rein to the hind feet. What I mean here is that I am sending a feel through my hand to the bit through the mind of the horse to its feet. That is what has meaning to the horse. Getting to the feet. So how is Belle doing? She is quartered to the fence, not parallel to it. I am going to ask her to come up here and we will see what she is going to do. There She is pretty parallel. Now I am going to see if I can send her over. We will see if I can get the hindquarters. I am trying to get her to walk those hindquarters around. That’s not good enough. There’s a try. Belle wants to approach at an angle. She is thinking of other things and not following my feel. She wants to walk up right here but I need the hindquarters. She didn’t line up the hindquarters quite good enough. She kind-of told us when we were saddling and brush her that she might not stick around for very long. This mare has got some ambition, some desire to do stuff. She is simply not used to staying with someone and being still. For the last several years, that has never really been part of her repertoire. She has been doing the leading – which keeps showing up in all these little things. Regarding the hindquarters, if they are working really well, then the front quarters are usually never a problem. If the front quarters are not working, nine times out of ten, you have a problem with the hindquarters. If I can get that horse to walk that hindquarter around me in that manner, either side here on the fence, when I go to ride him, I have some semblance of control. If a horse wanted to walk off or buck , I tip that hindquarter, out of gear and disengage it -- and prevent the horse from bucking, bolting or whatever. If you can’t get the hindquarters to yield, good luck.